It turns out textiles came with the house; old rare cloth, special scraps of forgotten history. They span the globe from Asia to the Americas, and reach back uncountable centuries. I had been thrilled to have been shown them on my visits with Bertie; and with her death, the responsibility of their existence has passed to me. I don’t want something that had survived 500 years to disintegrate on my watch. I read through the printed information on textile conservation that stayed behind with the books. I took everything out of the cardboard boxes, sorted and studied, and transferred it all into clear plastic containers. I rolled the coverlets and tunic in muslin. I bought special acid neutralizing hand wipes and a supply of cotton gloves. I needed a supply of acid-free paper, and I wanted to consult an expert before assuming I could properly care for these treasures, so I called our local art museum and asked for help. When I told them all I had, they offered to make a house call. Robin Hanson is the Textile Conservator for the Cleveland Museum of Art. She has a degree in the saving and preserving of old cloth. She came equipped with display samples to show me examples of how the pro’s keep things safe while still having access to them. She asked what I wanted to do, and suggested options for mounting and display or archival preservation. She measured things, took notes and ordered things I needed through the Art Museum (at cost). There is a small hourly fee for her time, but I consider it a great investment. 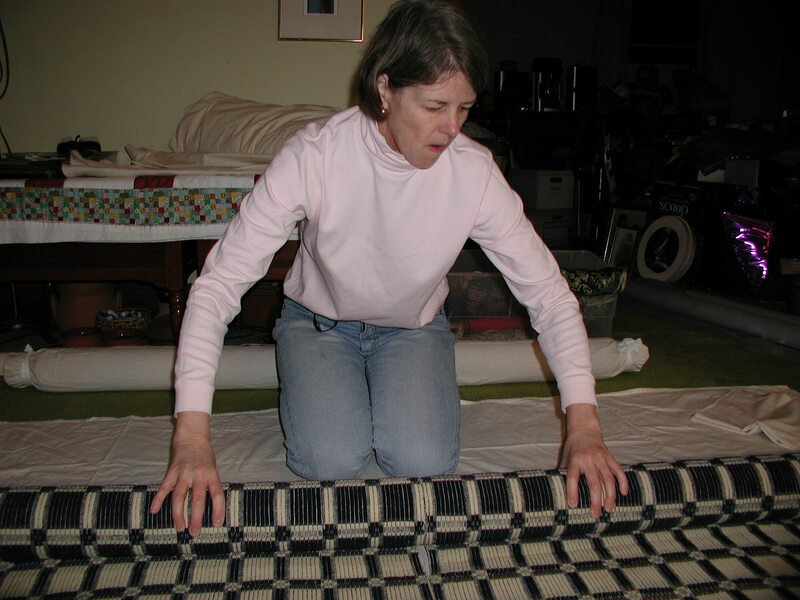 She returned in a month with supplies and taught me to roll coverlets for safekeeping. Robin said a conservator listens to what the fabric tells you it wants to do, but always tries to wind with the warp. I had cleared the living room and vacuumed twice before laying down a large sheet as a work area. By the third coverlet, she made comment on how her back and knees missed the padded work tables at the museum, but that a carpeted floor was preferable to slick hard wood at any elevation. She taught me how to “flake” the large pieces into an accordion pleat to create a rolling area no greater than a natural arms reach. She showed me how to start the cotton leader on the roll, and to wrap and secure it. She brought special hang tags that can hold a 3 x 5 card sized photo and information for quick identification. She brought an archival box and folded sleeves of acid-free tissue to safely house all the small scraps. I’ll need to figure where to keep the 8 foot long tube that is coverlet 3. The other tubes are small enough to stash in the library, but that one may need it’s own shelf built if it is to remain in the recommended horizontal position. Keep textiles out of direct light, and away from acidic papers. Flat storage is good, folding is bad, and almost all larger pieces should be rolled. Clear boxes are a better choice than the banker’s boxes for making things easier to find, but they out-gas unanticipated chemicals into the fabrics with unknown effect. Acid-free paper is the hard to get and essential to the proper preservation of textiles. Tightly woven cotton muslin or pima can be used to wrap fabrics for storage, but must be washed twice in hot water before use (little soap the first time, and no soap the second time through). Archival boxes and tubes are the way to go if it’s at all financially feasible. All paper and ink is kept away from the actual textile. Textile conservators are pencil people, and won’t chance the disaster to work with pens or sharpies. Every step is carefully considered for the preservation of something that cannot be replaced, and would naturally disappear into dust. We will have a textile conservation presentation as part of our scheduled program next year. This will give us all a chance to dig through our drawers and decide what textile treasures we have, or have made that should receive special treatment to preserve them for posterity. Thanks for this clear and concise writeup for textiles! I’ll be keeping close to my heart muslin to help protect valuable textiles and finished garments for long term storage.